PBIS is not about Effort – it’s about Outcomes! We are fortunate that eight schools in Arizona received PBIS recognition for achievement and outcomes in 2013. These schools submitted proof that they were implementing either Tier 1 or Tier 1-3 with high fidelity (as measured by nationally approved evaluations) and that their efforts resulted in outcomes verified by data (ODRs, violations, suspensions, achievement, etc.). 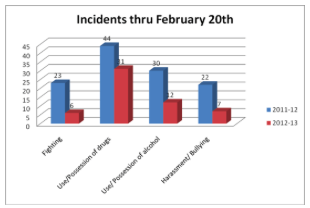 To see their PBIS Success Stories and their data, visit PBISaz.org. You can also contact me, to get in tough with the administrators and PBIS teams at any of these schools. These are all schools that my company, KOI Education has trained and coached so we are very proud of their accomplishments. Please reach out and congratulate these schools and school teams on a job well done by leaving a comment below – I’ll be sure to pass on your good wishes.